Imagine that on one shoulder we have the Spirit of Cooperation. This spirit is motivated primarily by the desire for everyone’s needs to be met. Fairness, according to Cooperation, means that everyone has the same rights, including the right to have a direct and equal say in decision-making around how needs get met. We find that the wisdom of the Spirit of Cooperation can lead us to using less resources and therefore having a more restorative impact on the global environment. By sharing things and space, we need fewer things and less space. Besides, working together can get a job done more easily than working individually. On the other shoulder sits the Spirit of Competition. This spirit is motivated primarily by the desire to inspire people to do their best and to find ways to do things even better. Competition seeks to offer rewards to those who use their talents to make investments of time and other resources in ways that help meet the needs of others. Fairness, from this perspective, means that each person is held accountable for their own actions, for better or for worse. Let’s take a look at some situations that have come up at Dancing Rabbit, and hear what the spirits have to say about them. The Milkweed Mercantile is a combination Bed and Breakfast, pub, cafe, and shop that has been open here for four years or so. About three years ago, someone else decided to open The Grocery Store, to serve the village’s bring-your-own-container dry goods needs. However, the new store would not be able to meet the supplier’s minimum purchase size. The Mercantile also had an account with the supplier and had also been handling some of the bulk purchases for larger food co-ops and others who could afford to buy and store large quantities of goods at once. If The Grocery Store could take on those orders, it could meet its minimums. The Spirit of Competition urged both business owners to strive for more sales for their own business. Competition also pointed out that some goods would make more money than others. Chocolate bars, for example, can get more income for the retailer than pinto beans. The bulk orders and snack foods were making money for The Mercantile and the owner was motivated to protect that income. Stocking bulk food like beans could be a complementary addition to that business someday, which would have been harder if The Grocery Store were to take over that niche. Competition told the budding Grocery Store owner that the bulk accounts are invaluable to getting the business off the ground, and could be worth making some sacrifice for. Undercutting The Mercantile by adding a smaller service charge to encourage people to switch was an option, but might not have the desired effect given the cooperative environment of Dancing Rabbit. Cooperation, meanwhile, reminded The Mercantile owner that she didn’t enjoy doing the bulk orders. Cooperation told The Grocery Store owner that undercutting The Mercantile would be rude; even if it did make business sense she shouldn’t do it, either on the bulk orders or on sweet treats. The Mercantile is better set up to serve people browsing for a snack, so Cooperation suggests that that’s where those items should be kept. When the two business owners got together to talk about the situation they came to an agreement that The Mercantile would quit doing bulk orders so that business could freely shift to The Grocery Store and, in exchange, The Grocery Store would not sell things that were already sold in The Mercantile. They’ve been operating that way for three years now and all seems to be going well. Both spirits are content. Let’s look at another situation: “Nancy” was considering providing a service to community members by picking up full humanure (“humey”) buckets, emptying, cleaning, and returning them. No one else was currently providing this service, and most people end up being responsible for about one bucket per week, between personal and community duties. Cooperation looked at the situation and wondered if Nancy’s taking care of other people’s humey might cause an imbalance: it’s a humbling task, and if anyone is able to get out of doing it, then everyone should be. Cooperation also noticed that not everyone is equally capable of executing a humey shift. Some are more pressed for time than others, are more affected by the smell, have stronger muscles, or are simply blessed with less aversion to doing gross stuff. Is it really fair, this spirit wondered, to make the same requirement of an 85 lb. solo parent with a full-time office job and a weak stomach as of a brawny, single, part-time farm hand? Cooperation suggested that perhaps those who are more capable could do the work in place of those who are less so. Competition put in that Nancy should be rewarded for her willingness to use her ability to do humey in others’ place, and compensated for the time she invests in doing it. If people would rather pay money or trade than do a humey shift, then by all means, someone should step into that role. In the last four years, at least three people have done humey for hire at Dancing Rabbit, and each of them has priced the service differently. One fellow charged $1.00 per bucket. He happened to be a young single person with negligible financial responsibility. He also claimed to actually enjoy the smell of the humey pile in summer. A while after he left the community, Nancy joined us. She charged $3.50 per bucket in the fall and was asking for more in the winter. A third entrepreneur (“Jo”) had the Spirit of Competition on one shoulder telling her that offering humey for significantly less than $3.50 could be comfortably done, and would be a nice job, for which she was well suited. Spirit of Cooperation also told her that $21 for a six bucket shift seemed, perhaps, unfairly burdensome to those who were less able to perform the task themselves. However, Cooperation was worried that it would be rude to step in and offer to do the work for less. In the end, Nancy left the community and Jo has been doing humey cheerfully for $2.50 per bucket for two years now, and both spirits are mostly content. Setting prices is a common topic for Cooperation and Competition to be weighing in on at Dancing Rabbit. Business owners have a lot to think about in that area. Cooperation points out that, even if someone can afford to, charging too little for a good or service makes it very hard for anyone else to earn a living that way. In other words, it’s not nice to charge less for something than the amount that will eventually equal a living wage, even if the proprietors don’t need the money, because that means that no one else providing the same services will be able to earn a living wage, either. Charging too little to live on in the absence of other income creates a financial need that others will have to make up for, somehow, which is generally OK with Cooperation, though it would prefer that all parties give consent before engaging in sharing resources. In balance with that, the Spirit of Cooperation is also holding that everyone should have the same access to goods, services, and opportunities regardless of personal abundance and scarcity, and low prices are most universally accessible. Competition’s take is a little more straightforward: Don’t charge too much because the market won’t bear it, and don’t charge so little that it’s not worth it to do the work of both present services and future innovations. As illustrated with the humanure example, the process of setting prices can be one of trial and error over time and multiple providers. It can also be a collaborative process. For example, the makers of tea and tinctures for sale have checked in with each other about prices for their products. Most business owners I talked with at Dancing Rabbit set their prices by looking at the prices for similar services and products both inside and outside the community. The businesses are all so young, and the environment is so unique, we’re still figuring out what works. There are also cases in which folks wonder whether to charge for something at all. Should the person who has spent years of time, hard work, and money collecting education and experience on a topic serve as a mentor to those who haven’t made those investments so they can benefit too? Should she do it for free? Input from the spirits is mixed on this question. Competition is clear that in the interest of rewarding these people for their work and compensating their investments, they should not give away their earned advantage. In short, no, don’t give away information for free or put zero value on learned skills. If we do that, there’s less to motivate people to do work, make investments, take risks, and innovate. Cooperation, as usual, has a more complicated view. On the one hand, Cooperation likes sharing. One person in a community going through lots of trouble and expense to educate herself about, for example, raising farm animals, is probably enough. It goes against the Spirit of Cooperation to give that person more power to support herself than anyone else. Cooperation is particularly concerned about cases of disparate resources. Should unearned influences like intelligence, wealth, a loving upbringing, strong work ethic, place of birth, attractiveness, innate physical strength and health, innate emotional strength and health, perceived gender, perceived race, curiosity, and luck that might lead to one person having more knowledge than another give that person even more advantage than they already have? On the other hand, though, it is most fair for everyone to work to the same proportion of their capacity. Everyone has the right to leisure and ease—not just those who chose not to plan ahead, but also those who make sacrifices for their education and development of skill. At Dancing Rabbit we do tend to share information and give of our skills, somewhat freely, although it varies noticeably from person to person and skill to skill. Of the two nurses who’ve lived here during the past four years, one was reluctant to be approached with health-related questions and the other is quite open to offering advice. When the owner of The Grocery Store finally hires an accountant to get her books in order, it will be for about three times Dancing Rabbit’s base wage, because not having to take a course in accounting is valuable to her. At the same time, it is not uncommon to see instruction in skills like massage, yoga, and co-counseling offered for a sliding scale contribution to the teacher. Sometimes people seem to feel awkward about placing a value on their skills, among such intimate neighbors. As with valuing our services, valuing our skills is an aspect of village life each of us considers by weighing what feels right in each case, with the spirits of Cooperation and Competition both offering their input. We have a coin-operated washing machine in the Common House. For a while, it was privately owned, with the owners paying a fee for its use of space, water, and electricity, and handling its repair and maintenance, and setting prices based on the cost of use and some payment for their time spent managing it. When that machine needed to be replaced, we decided that the community would start a laundry co-op. One of the decisions that was stickiest was whether to charge per load of washing or per person. The spirits of Cooperation and Competition were both in the room. We’re something like 70 people plus guests and visitors who share one washing machine and don’t have a dryer. That’s pretty eco. We also tend to not wash our clothes after every wearing, which saves on water and energy use and extends the life of the machine. Competition is the more goal-oriented of the spirits and sees that being environmentally responsible is a goal of Dancing Rabbit. Competition can motivate people toward that goal by rewarding them for doing less laundry. Charging for each load is one way to do that. Some people prefer to be cleaner than others, and Cooperation can care for people on all parts of the cleanliness-wanting spectrum by advocating for a co-op fee per person, instead of per load. Also, using a monetary “penalty” on behavior that we want to motivate people to minimize is not equally effective or burdensome across the range of financial abundance, and that’s not Cooperation’s idea of fair. In a related case, with the shower co-op, we took the route of a monthly per-person fee, which has worked fine. In addition to the cooperative ideal of taking care of everyone regardless of their bathing habits, charging per use would be prohibitively impractical to do with showers, anyway. Even so, at least a couple of folks have been heard to gripe that, “Sometimes I think the shower co-op is taking advantage of me.” $1 per shower for those who bathe weekly feels different than $8 per shower for those who treat themselves bi-monthly. It’s especially hard for some who see the infrequency of their showers as a sacrifice in line with Dancing Rabbit’s mission. For the washing machine, in the end we went with a coin-operated model. It seems to be going well, although The Spirit of Cooperation was a little bummed. If Competition has its way all the time, without any regard to Cooperation’s perspective, things can get ugly. We’ve seen examples of this in the wider US culture. The idealness of competition depends on the quality of decision-making of the consumers, who have finite time and energy for research and consideration. Perfect thoroughness in information is not always in a company’s best competitive interest either. Imagine if a t-shirt label read, “Organic Cotton, grown in the USA, shipped to China for processing into fabric, shipped to Mexico for stitching, and treated with water-polluting fabric softener and dyes.” With that level of transparency, more people might give their business to thrift and consignment shops. Straightforward competition makes the most sense if all providers and consumers had similar values and thoughtfulness about the impacts of their choices. That might be why competition among businesses at Dancing Rabbit seems to go better than out there in the wide world. As we get bigger and more diverse there will be more pitfalls to watch for, since we won’t know as much about each other and the breadth of our range of values is bound to increase. Competition in business can lead to power imbalances, too. In the best case, people who are more capable (and consequently powerful) will be more successful and so have more money, which adds to their relative power, and can in turn lead to more success, more money, and so on. This is one of the problems with competitiveness that is talked about most around Dancing Rabbit. From early in the community’s history, people have been thinking about ways to minimize that effect, as with the standard wage. Of course, cooperation can have its unappealing consequences, as well. If people want to cooperate they first must agree what they’re working toward and that process can be cumbersome at best. At Dancing Rabbit folks who choose to engage enough to be part of decision-making have already self-selected out of the general population; we’re more in alignment than a random group of strangers. Even so, we’ve spent hundreds of person-hours in group meetings and hundreds more of committee and personal time talking about how to reach agreement on how best to fund our new common house, and still there is some discord. Even more so than with competition, good cooperation requires folks to be honest with themselves and others in ways that don’t always come easily. If we set out to meet everyone’s needs and make the most of their abilities, we have to be clear about what those needs and abilities are, and there’s no way to be objective about what is going on inside a person. Even that person will have a hard time distinguishing their abilities, weaknesses, and requirements. Also, in a cooperative environment, a person surreptitiously or unconsciously behaving competitively will make things easier for themselves and harder for everyone else. Some kind of accountability is called for. We already see this tension coming up at Dancing Rabbit as we consider how to fill all of the volunteer, semi-volunteer, and paid positions it takes to do the work of running this village and nonprofit organization. As we grow in size and diversity, the issues of trust and evaluation will only become more important to pay attention to, either to avoid imperfections, or to explicitly accept them as part of a cooperative culture. 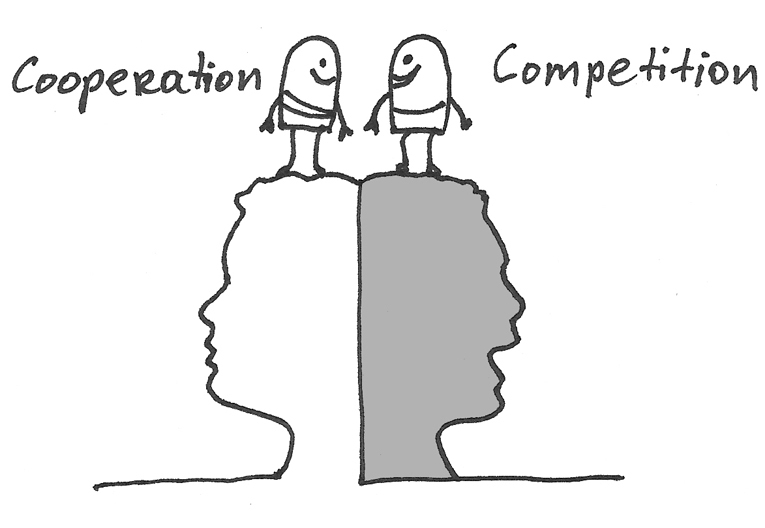 Competition and cooperation can coexist harmoniously. Though there are challenges, the beauty is in the interplay between sharing what we have and asking for what we deserve. In so many ways, from affordable land leases, to free advice about chickens, to effortless hugs on the path, we work together in a way that makes earning a living based on responsible competition more possible for everyone. Sam Makita moved to Dancing Rabbit Ecovillage outside Rutledge, Missouri (www.dancingrabbit.org) in late 2009 from suburban New Jersey. Among other things, Sam writes for the weekly newsletter and runs the village dry goods store. ← Nonviolent Communication, A Communication Toolkit Must-Have. Get Your Copy Today!